While on vacation with my sister and brother-in-law, Rick, we got some chicken flavored biscuts. Rick is a fan and the only person I know who eats Chicken in a Biskit so I sat down with him and Ethan (my sister refused) to evaluate these poultry-themes crackers. The first thing Ethan and I noticed was the extreme saltiness of these crackers. Rick described the texture as moist and flaky, which it was. My 3 1/2 year old nephew said they smell like chicken. I don’t know if I’d say these tasted like chicken if they were called something else but I guess it was something like dry chicken soup mix in a cracker, although Ethan did note that they do actually have dehydrated chicken in it as well. I thought these crackers looked “friendlier” somehow but all every one at the table had to say about these were “gross” or “just gross”. That’s because they were. the only description I could drag out of anyone (other than gross) was “stale” and Ethan said it’s tastes like the grey pieces of chicken in cans of soup, and it really did capture that essence. My nephew wouldn;t even try it after sniffing it. Chicken in a Biskit wins for not being a totally repulsive cracker. I won’t be buying these again though because they’re way too salty and I don’t like things with MSG but if you have to pick one of these we’d suggest Chicken in a Biskit over the second rate version. Chicken in a Biskit or Chicken Flavored Snack Crackers? 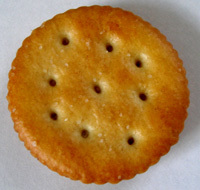 Ritz has a nice crunch, that I’d describe as a “soft crunch”. 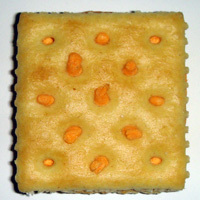 A nice buttery flavor and just the right amount of salt on top to compliment the cracker. Between the texture and the flavor this is a well-rounded (pun intended) cracker that goes beyond the serving suggestion and goes well with pb&j and, as I mentioned before, is very nice in chicken soup. These had a different crunch, sort of dryer. 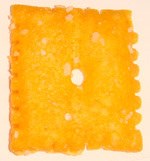 There is a lack of buttery flavor, and they taste more like Saltines. 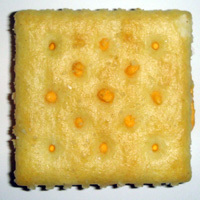 Salt is present but a little too sparse on the surface, yet still a somewhat satisfying cracker. Not Ritz but not bad. 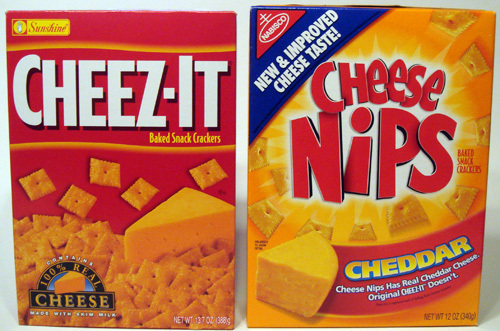 We went with Ritz for it’s buttery flavor and full-bodied crunch. 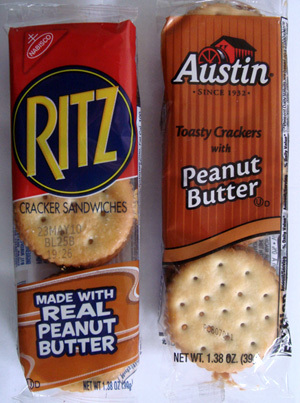 I would like to point out though that Goya does make a very suitable cracker that even Ethan (who is a Ritz fan) said he probably wouldn’t mind if he had to substitute these for Ritz. So if Goya is all that’s available, I don’t think you’ll be too disappointed. To make a long story short, Ethan and I found ourselves shamefully at Wal*Mart tonight. I won’t get into how I disagree with their business practices but we just went and figured while looking for what we needed, it may be a great source for second rate snacks. We got some good ones, but the most impressive product we found was Stauffer’s Whales. Of course we were compelled to try them so they made it into the basket and after waiting 20 minutes in the check-out line, we brought them home to test. 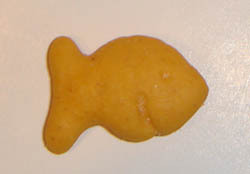 These crackers were a little larger than Goldfish, (much like how real whales are bigger than real goldfish!) 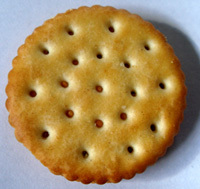 the first thing I noticed when I put one in my mouth was the nice salt-to-cracker ratio. 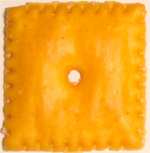 I like to just move the cracker around in my mouth and take in any cheddar flavor before chewing, and did get some flavor. Ethan felt that although they didn’t really taste like cheddar, they were good. I felt the flavor in general was pretty good but something about the texture seemed dense or stale or missing a certain crunch but Ethan thought the texture was fine, so maybe it was just me. Next was our childhood classic, Goldfish. These actually seemed pale in flavor after the Whales. 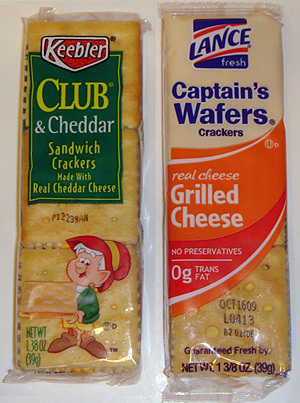 We agreed they were lacking any real cheddar flavor and actually tasted more like a saltine. Even the salt didn’t seem as good on these. It’s saving grace was the texture which was a little more crunchy and didn’t seem as mushy after chewing. 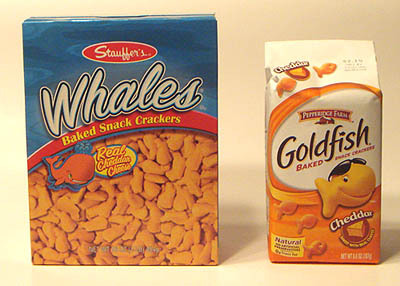 It was a big surprise that we found ourselves enjoying the Whales more than the Goldfish, BUT you *might* say they cheated, since they do include MSG in their ingredient list and Goldfish doesn’t. Since we haven’t seen these before tonight I’m not sure many other people have but I’ll ask anyway.